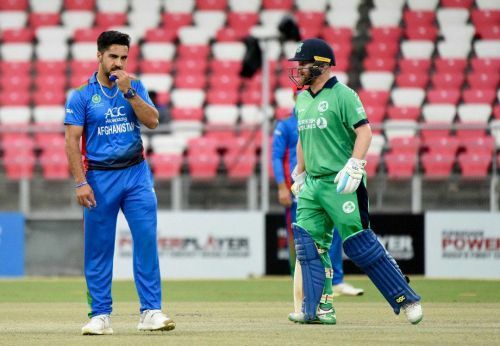 The stage is set for the fifth and final ODI between Afghanistan and Ireland which will be played at Rajiv Gandhi International Stadium, Dehradun. After a gripping and wearying series, we will witness if Afghanistan seals the series or the Irish can satisfy themselves with a 2-2 draw. Fans could be in for another epic encounter between two dark horses of the cricketing world. Afghanistan made a sensational comeback in their previous outing against Ireland. After losing the third ODI by four wickets, the Afghans landed a counter punch in the penultimate game of the series to register a mammoth 109-run victory against the same opponent. Md. Nabi and Rashid Khan were pivotal to Afghanistan’s success in this crunch game. The ace duo stitched a crucial 86-run stand down the order to take their team to a respectable total. They also took three wickets between them in the second innings to take Afghanistan over the line and 2-1 up in this ODI series. Ireland, on the other hand, has been struggling against Afghanistan since the beginning of this tour. Having lost the T20I series, the Irish team seemed battered and bruised for the forthcoming ODI series. The visitors scripted a famous 4-wicket win in the third ODI against the Afghans. However, their performance in the previous match proved once again that they are indeed not good enough in the international circuit especially their batting lineup. They have to bat out of their skin in the final ODI if they want to draw this ODI series level at 2-2. Mohammad Shahzad was rested in the last game, he might feature in this crunch game. Ireland can make few changes in the starting lineup to strengthen their batting lineup. Ireland: Simi Singh, George Dockrell, Paul Stirling, Andrew Balbirnie, Andy McBrine, Boyd Rankin, Kevin O’ Brien, Stuart Poynter, William Porterfield, Tim Murtagh, James Cameron-Dow.